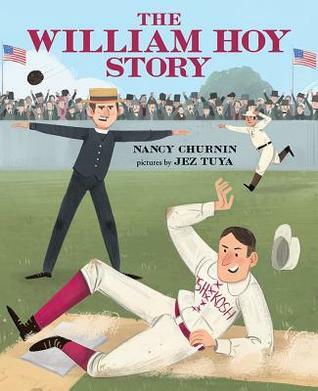 Summary: When William Hoy graduated from high school in 1879, there wasn’t much chance of a deaf man making it in the world of professional baseball. But Hoy was talented, hard-working, and determined, and he managed to snag a spot on a minor league team in Oshkosh, Wisconsin. He loved the game, but often ran into trouble when he couldn’t hear the umpire make the calls. After a humiliating incident in which he didn’t know he had struck out, Hoy came up with the idea of the ump using hand signals…the same signals that are used today. Eventually, he went on to great success as a major league player with the Washington Senators, and lived a long and happy life, throwing out the first pitch of the World Series in 1961 at the age of 99. Back matter includes author’s note and a timeline. 32 pages; grades K-3. Pros: A fun and inspirational baseball story about a little-known player who overcame difficulties and changed the game. Cons: Hoy’s nickname of “Dummy” (mentioned in the author’s note, not the main text) will need some explanation.